See my latest theAtlantic.com column here. 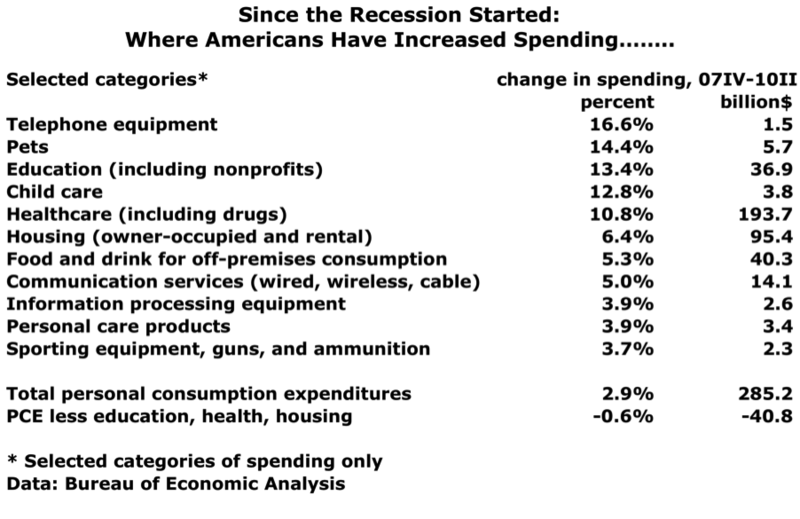 Where can Americans cut back if the economy slips back into recession again? After all the talk about the “new frugality” and the deepest recession in 75 years, it might seem like households have tightened their belts as much as possible. 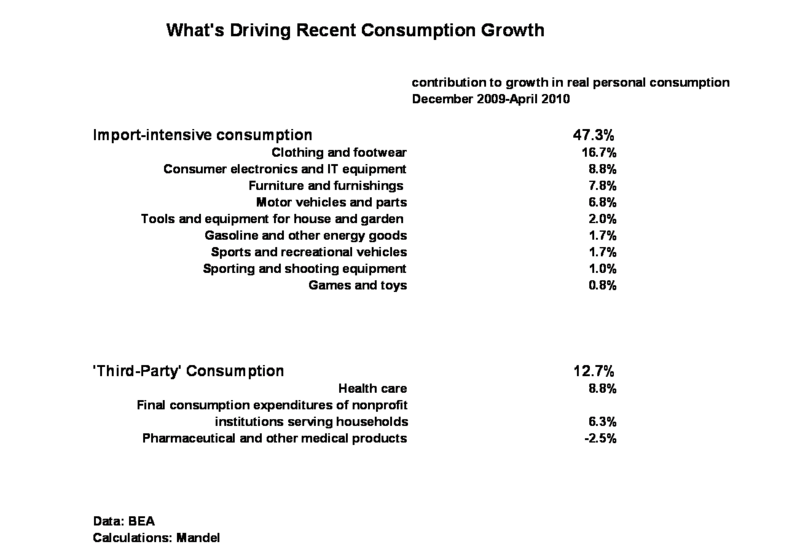 Despite the economic weakness, Americans spent on clothing at an almost $350 billon annual rate in the second quarter of 2011. Nothing seems to stop the waves of inexpensive shirts, dresses, and coats coming from overseas. Clothing imports from China, especially, are up 37% since 2006, and Americans are snapping them up. Perhaps we could buy a a few less t-shirts with funny sayings on them? We like to look our best, even in a recession. Perfume, makeup, shampoo, shaving cream and razors, body gels–Americans spend about $100 billion a year on these personal care items. Not only that, we’re spending more on imported cosmetics, which are up 26% since 2006. Are all those goos and gels really necessary? No, that’s not a misprint. The government adjusts for the size of the television, among other things, and the average size screen has soared since 2006. If we don’t adjust for size and other variables, Americans are spending 12.7% more on televisions today compared to 2006. 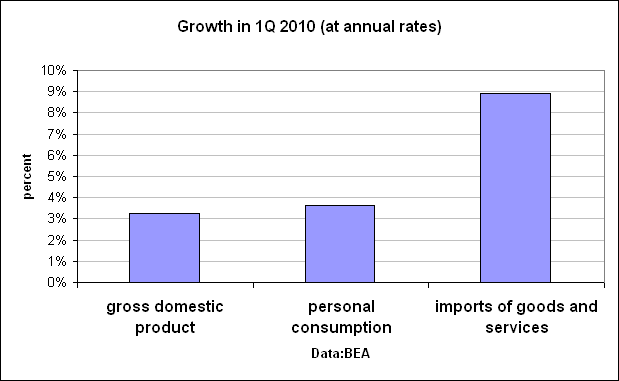 Total personal consumption outlays on televisions, according to the BEA: About $40 billion, pretty much all imported. Do you really need an even bigger TV? Perhaps it’s not surprising that Americans need an extra drink these days. Still, the total home spending on alcoholic beverages is about $110 billion, at annual rates, according to the Bureau of Economic Analysis. A few less glasses might put a few extra dollars in the pocket. Remember, all these figures apply to Americans in the aggregate. Those people who have been out of work for months or years don’t have room to cut back at all. 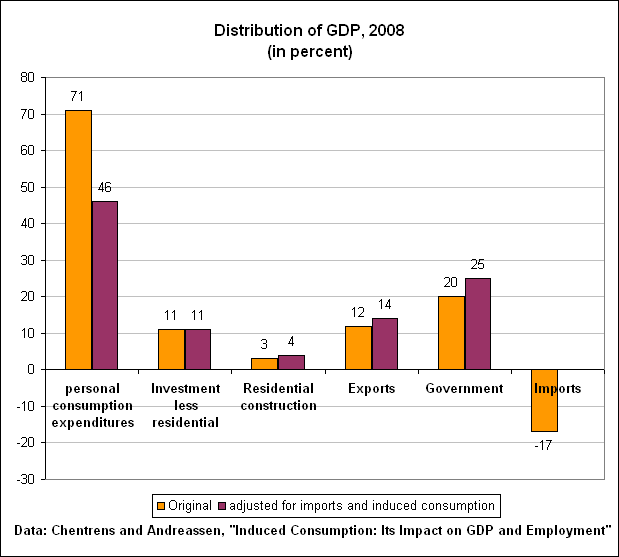 And remember–when journalists write that “consumer spending is 70% of economic activity,” they are completely wrong. What the U.S. economy needs is more production, not more consumption–and in a globalized economy, the two are not synonymous at all. And that, my friends, will be the subject of tomorrow’s post. Vampire Meme: Consumer Spending is 70% of Economic Activity–NOT! * Consumer spending, especially this time of year, includes a lot of imported goods. So when you buy a toy, a shirt or a big screen TV, just flip it over and look at the label– your money flows out of the country to stimulate economic activity in China, or Korea, or Mexico. * The government’s definition of consumer spending includes Medicare, Medicaid, and money spent by nonprofits such as political parties and religious groups. So when you see pictures of Americans buying toys, clothing, and consumer electronics, think about happy workers around the world. U.S. consumers drive global economic activity. For some of my other posts on the subject, see here and here. Hall of Shame–news organizations who got it wrong.